I finally spent a little bit of wakame! I find it the hardest ingredient to use up in this pantry challenge, honestly after making this dish I’m pretty sure it’ll be impossible to spend it all until the end of the month. 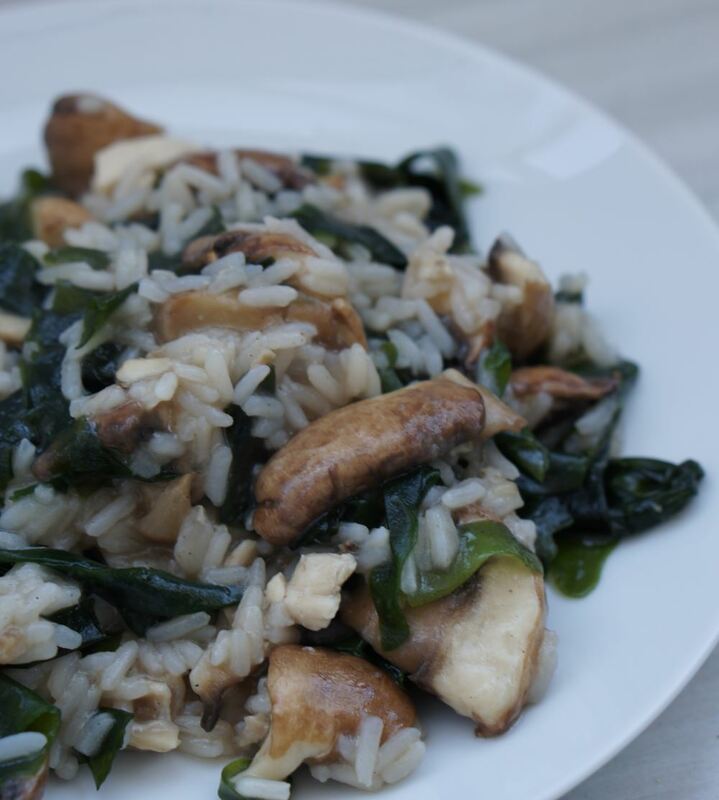 Above it’s what I made on Saturday, I made a chicken wakame risotto to use up some of the wakame that I had. Here’s how I made it. I used some chicken breast bone (that still had meat on it) and cooked it to make it a broth. Meanwhile I put the wakame in water, three tablespoons (this was way too much!). I started making the rice and added my broth, once it was two thirds done I added about 4 chopped Marron mushrooms and started to take off the meat from the bone and added it on the rice. Once everything was ready, I took it out and added my seaweed. Like I said above, three tablespoons of wakame was too much. If I did it now I would have added just one tablespoon of dried seaweed. Once it expanded it was about 2 cups of seaweed and it just overpowered the dish, we did eat everything but it just made me hate wakame a little bit. Just one more reason to make it more difficult to eat it all until the end of the month. Most of last week after the post was spent eating leftovers (like the curry we made last week) or just quick meals. Tuesday, I spent the last Japanese curry mix cube that had expired in the 15th and used a bunch of zucchini, I now only have about 200gr of zucchini, finally!!! We also ate a bunch of vegetables that my mom gave me that she didn’t have time to spend: cucumbers, tomatoes and green beans all out of the fridge. We’re kinda lucky that my parents come frequently to Porto for work, they usually bring us something. Rice! Honestly it’s pretty hard for us to live without rice and I don’t think we could spent the rest of August without it. We still have some risotto rice to spend but regular rice is a must. Trying to keep it real here, it’s a pantry challenge but it’s hard to live without some items. I also bought oats and almond butter because I made granola bars! Ideally I would have bought oats in bulk but since it was Sunday none of the bulk stores were open, and I knew that I wouldn’t have time to go shopping during the week. I had lots of seeds to spend and dates (which I had in the pantry for a long time) and decided that this would be the easiest way for me to get rid of them quickly. Oats is something that I use a lot so I guess it’s okay, almond butter I don’t use it often but will come up with ways to use it, I’ve been super curious to try it out but never did until now. Next week’s post won’t be Wednesday (or Thursday like today), instead it will be at the 31st to complete this challenge. Curious to finding out what did you guys eat during this week, let me know in the comments!